Misleading News Article in N.Y.Times Newspaper | Hey, you know what? The news writer, who wrote the article below, apparently does not know the background behind this issue. 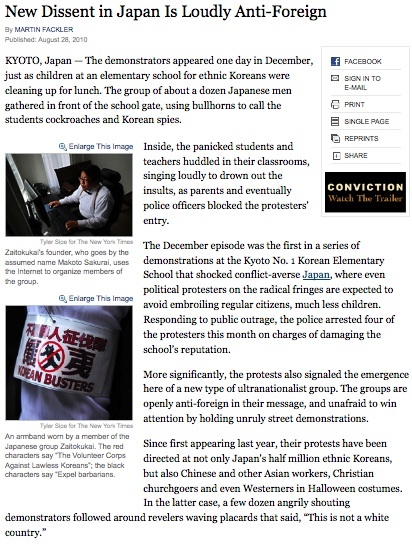 Or the writer intentionally has written it to snare the Japanese protestors with the interests of the North Koreans. The issue has a long history behind it. After the World War 2, over 600,000 South and North Koreans did not go back to their homeland, Korean Peninsula and kept staying in Japan without going through the Japanese immigration law and regulations. They did not want to be naturalized as Japanese nationals, yet they want to keep living in Japan because Japan is an affluent society comparing to Korean Peninsula. as South Korea and North Korea and more illegal Koreans got into Japan. Anyway, the news article is about the public park in Kyoto which had been illegally occupied by North Koreans and used as a part of their school yard across from the school building more than 50 years. As you may know, Japan and North Korea do not have regular diplomatic relationships. Though it is unusual situation, they have their own educational facilities based on their communists’ ideology and they do not follow Japanese educational systems. Japanese people were very patient about Koreans’ illogical conducts for a long time. But they have started to claim so many social benefits that most Japanese people can not get easily. For example, so many of Koreans depend on their living supported by Japanese. So many of them got involved underground economy and commit crimes. And now, they request a right to vote political elections without paying decent tax money and declaring allegiance to Japanese country. And some of Japanese people in Kansai Area got furious and protested against the North Koreas. The wrong side is North Koreans who had occupied the public park with no permission from the local government. I strongly protest the writer who wrote the article and damaged the image of Japan and her people.